For those who has been an avid follower of my blog will know, a couple of days ago, I suddenly had a craving for some comfort food from my hometown, Singapore. I therefore decided to revisit my nan's Singapore Hainanese Chicken Rice recipe. It has brought back an awful lots of memories and kind of triggered an urge to recreate more of my familiar hometown favourites and this is the one of them. Anyone whose been to Asia would have heard the infamous Chilli crab. It is just as popular, if not more than the Singapore Hainanese Chicken Rice. Even Malaysia has their own take on this classic dish. Being a tiny island surrounded by the sea, Singapore have an abundance of fresh seafood and this could possibly be the best way of cooking them. The piquant sweetness just seemed to complement the fresh crab perfectly. 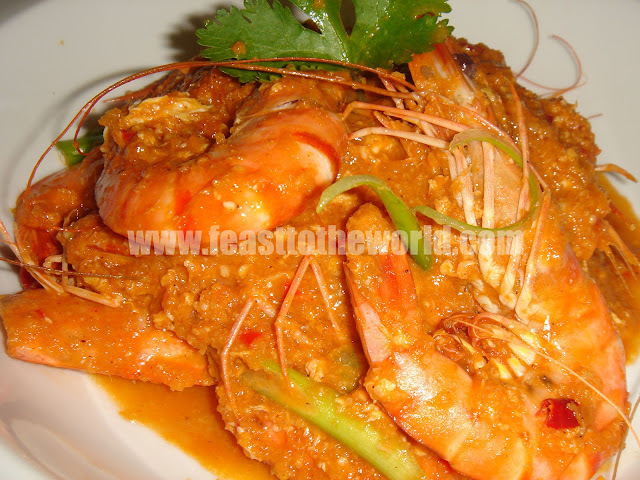 The main components of this tasty dish are very simple; the freshest crustaceans that you can get your hands on, you want them to still be twitching gently if possible but those in a calm meditation state, laying on a bed of crushed ice will also do. Whatever you do, definitely not the cooked ones that you find in most supermarkets; some bottled ketchup (Yup! You've heard it right...KETCHUP! 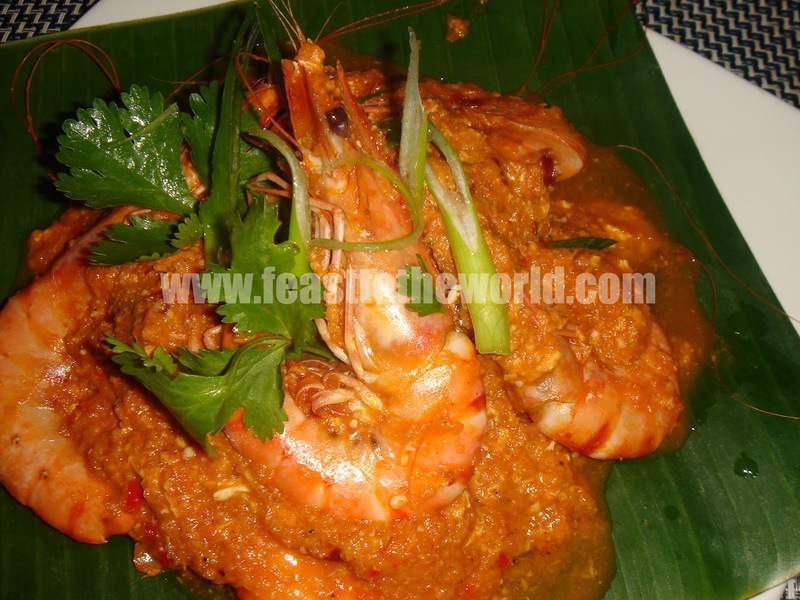 ), not the most exotic ingredient or one that you will associated with South-east Asian cuisine but a true Singaporean will never dare to dream of cooking this dish without it. If you ask me, a chilli crab won't be a chilli crab without a few dollop of ketchup in the sauce; of course then there is the chilli sauce, bottled ones will do but you can of course make some up from scratch, I will write up a recipe for a version of my homemade chilli sauce at some later stage. Every household has their own recipe for this delectable dish depending of whom you ask but provided that you include the ketchup and chilli sauce, all the rest of the ingredients can be included or left out depending on your personal taste. However, a beaten egg at the very final stage is absolutely essential as this is what will give you the signature 'curdled scrambled eggs' silky texture. These are perfect for you to mop up with some fresh crusty bread. We used to fight over the last bit of the yummy sauce and not the crab itself when I was young and it just shows you who is the real star of this dish. I have to unfortunately prepared this dish using fresh raw prawns as there weren't any fresh live crabs available at the time but these were just as as delicious. My partner, M who is not a massive fan of having to use fingers when dining even end up sucking the sauce right out of the shells...in true Singapore style and that's how we like it! Next up on the list....Chicken Satay with Peanut Sauce. Firstly, prepare the rempah/spice paste. Add all the ingredients for the rempah/spice paste into a food processor and pulse to a paste. Do this in a mortar and pestle if you wish. Next, mix the tomato paste, ketchup, chilli sauce and water together in a bowl to combine and set aside. Heat the oil in a wok or large frying pan over high heat. 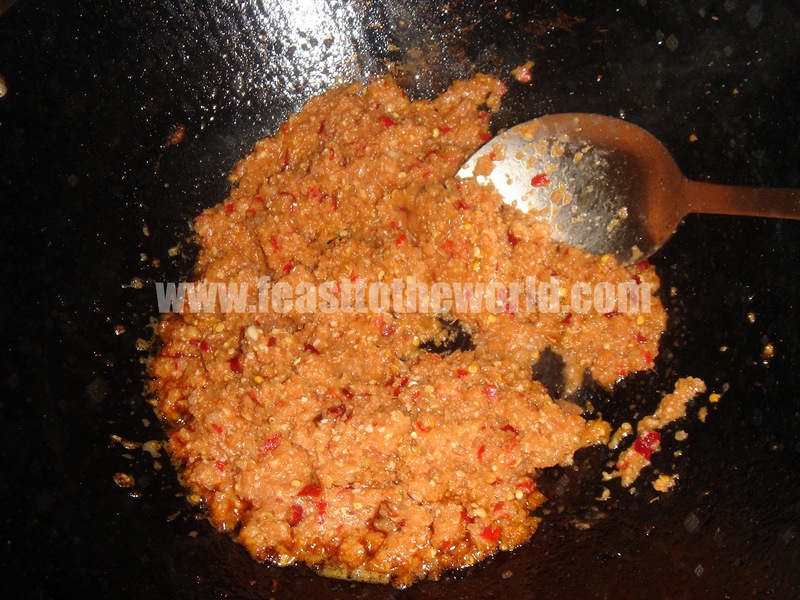 When hot and smoking, tip in the rempah/spice paste and stir fry for 1 minute, until fragrant. 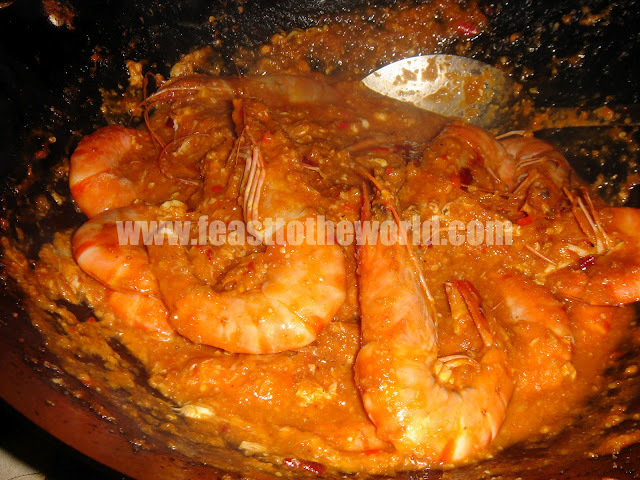 Add the prawns and stir to mix well. Pour in the sauce and allow it to come to the boil, stirring regularly. 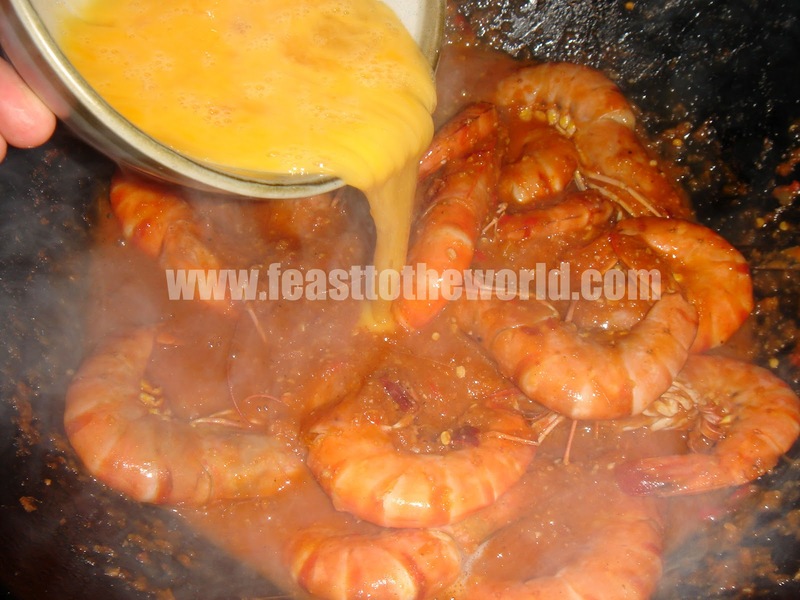 When the prawn are cooked and has turn fully pink and opaque, quickly add the beaten egg, stirring until the egg is well mixed and cooked, about 1 minute. You should now have a thick, scrambled-egg like consistency, don't worry as this is how it meant to be. 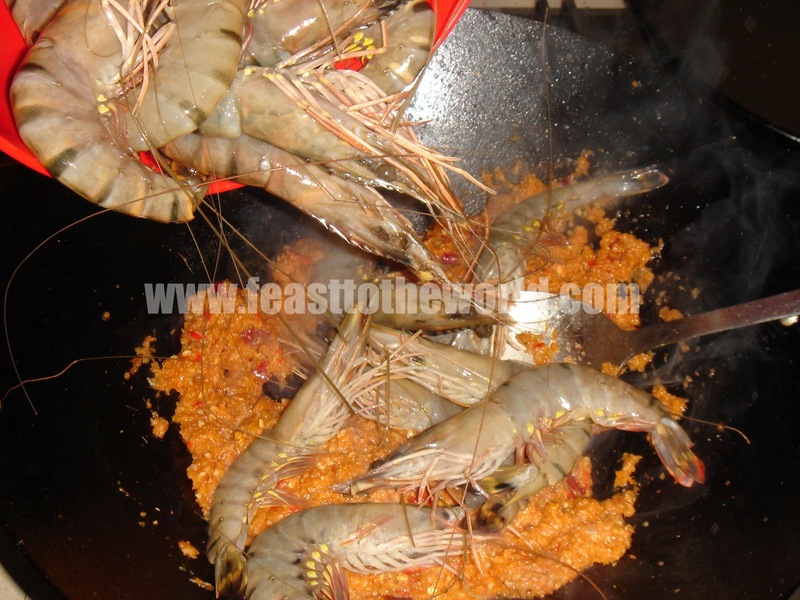 Remove from heat, add the lime juice and season with salt and pepper to taste. 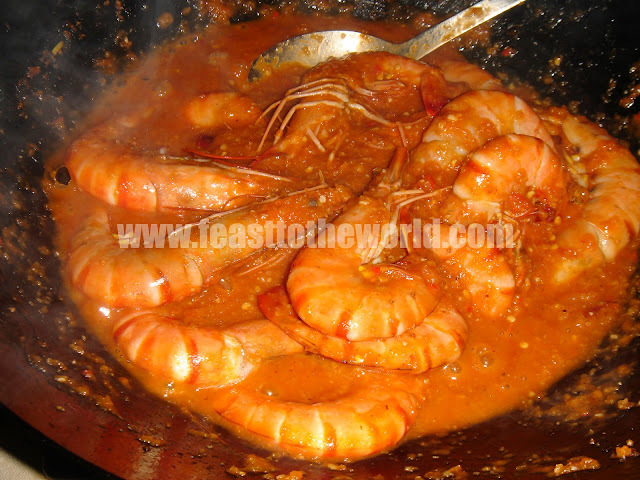 To serve, arrange the prawns in a large plate, pour over the sauce and scatter with coriander leaves. Baguette or any other crusty bread is a must to mop up all the lovely sauce. Looks darn good! I am going to try this!